Pretty much everyone loves penguins. Scientists love penguins because penguins make for revealing studies about the health of our simmering oceans. Lovers love penguins because penguins remind them of the enduring power of mutually faithful monogamy. Tuxedos love penguins because, with those peculiarly flightless birds, tuxedos share a nostalgic longing for a simpler world before the advent of Technicolor. Leopard seals love penguins for eating. You see? The world is unanimously in love with penguins, so I'll forgive you for incredulously murmuring, "But I already love penguins as much as anyone can love anything" when I inform you that an adorable Magellanic penguin couple will make you love penguins even more than you already do. Impossible? 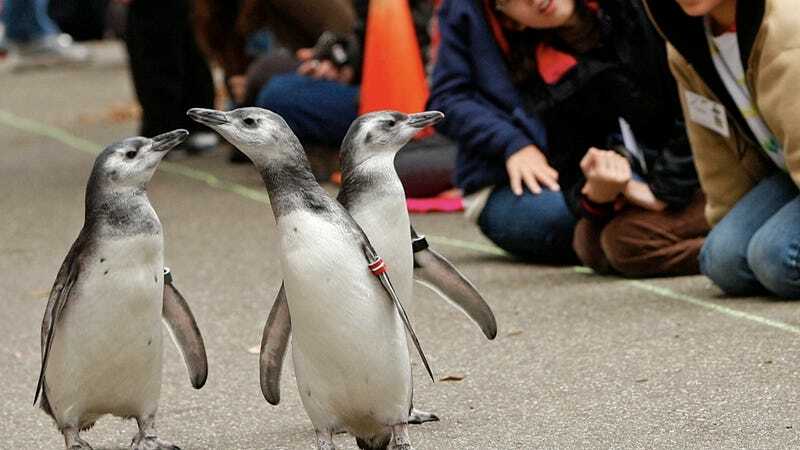 Hardly — these two penguins have, according to Drs. Dee Boersma and Pablo Garcia Borboroglu, been together for 16 years, a span of time that accounts for nearly their entire breeding life, making these two love birds (that's a quaint idiomatic expression for "monogamous slam pieces") the Cory and Topanga of the animal kingdom (or the Cory and Shawn, if you prefer not to be constrained by the manacles of heteronormativity). I'll just go ahead and assume that we've all seen March of the Penguins and Happy Feet, and so are well-versed in penguin romances. Bien. The short version of penguin breeding habits (for all you cinematically parochial readers) is that all penguins exchange promise rings when they're in penguin musical theater programs. Upon graduation, all the betrothed penguins get officially hitched. All the loners step out on an ice floe and die of shame or whatever, but who cares about them? They're probably some fatal combination of ugly, stupid, smelly, and ornery. Meanwhile, the young penguin couples are busy each breeding season for caring for their precious few eggs. This cycle goes on for as many as 20 years, but most monogamous breeding pairs, according to voyeuristic biologists, are abbreviated due to failed breeding liaisons (penguins get penguin divorced when their union fails to produce chicks) and death at the cruel, icy knuckles of the Patagonian hellscape Magellanic penguins inhabit. The 16-year penguin couple has, therefore, surmounted pretty serious obstacles in order to return to the same breeding spot year after year and make new chicks. Their story of enduring biological efficiency is part of a 30-year study of Magellanic penguins by the good Drs. Boersma and Borboroglu, the latter of whom said of the penguin couple's unique durability, "The bond they have is incredible really." Then Dr. Borboroglu pulled out his handkerchief and was all, "You guys, please excuse me for a minute. I have to check some...instruments. No, I'm not crying — I'm just allergic to true love."